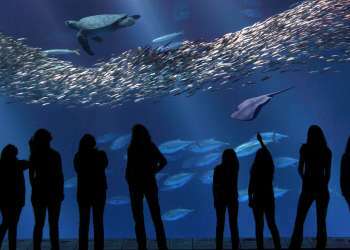 Monterey Bay is a coastal haven not only to humans enjoying ocean recreation activities, but also to a diverse community of marine wildlife. As residents and visitors enjoy the amazing outdoor activities Monterey Bay has to offer, they will unavoidably cross paths with some of the non-human residents that call this special place home. Sea otters, seabirds, shorebirds, harbor seals, sea lions, marine invertebrates, and fishes all find important resources—food, shelter, mates—in the same places we love to paddle, swim, dive, or stroll. “We are the seabirds of the Central Coast, and you will be visiting us in our home. We nest on the cliffs and offshore rocks from January to August, and rest in those places year-round. We are fun to watch feeding our young, trying our first flight, or diving for fish. Remember to bring some binoculars for a close-up look. “I am a sea otter from Monterey Bay. Look for me and my fellow sea otters eating, swimming and sleeping on our backs. I dive to the sea floor to find prey and use my belly as a table. If you look with binoculars you may be able to see what I’m eating! Since I don’t have a layer of fat to keep warm and store energy, my energy bank account must balance each day. When you come too close with your kayak or boat I may get frightened and swim or dive to escape, wasting energy that I need for feeding, grooming my fur, swimming, and staying warm. If I get too used to people being near, I may bite! Humans that quietly observe from no closer than 5 kayak lengths will be able to observe my interesting behaviors without disturbing me—If I’m looking at you, you’re too close! Enjoy the marine wildlife that call Monterey Bay home but remember to leave in your wake no trace that you were there, not even a moment of unnecessary swimming or stress. Treat your wild neighbors with the same courtesy and respect you expect of guests in your home and you will become stewards of this extraordinary coastal community. 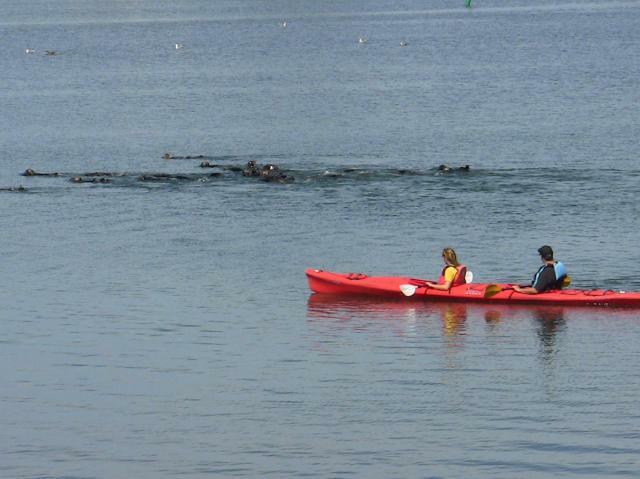 Challenge yourself to not ruffle a feather or move a flipper as you explore the bay! 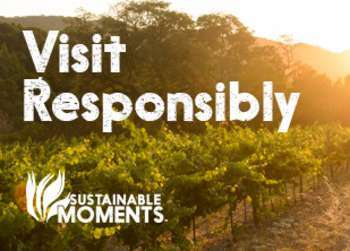 Before you begin to explore Monterey Bay’s shores and waters, take a few moments to learn how you can be a good coastal citizen by visiting websites for Ocean Etiquette, Seabirds and Marine Mammals. Since 2001 Gena has worked as a sea otter biologist, studying them in such wide-ranging locations as the Alaska, Russia, San Nicolas Island off the coast of Southern California, and along the Central CA coast. After years studying sea otters in the wild, Gena has learned much about their unique biology and behavior and witnessed first-hand the chronic nature of their disturbance by human activities. 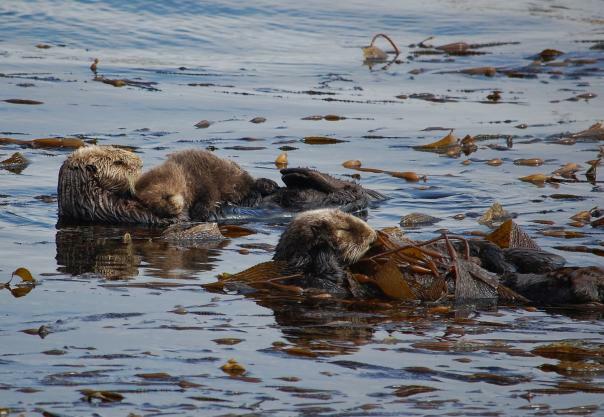 In early 2014, together with members of the Southern Sea Otter Research Alliance, she began to pursue the idea of organizing a program specifically dedicated to alleviating this chronic disturbance through education. Gena now coordinates the Sea Otter Savvy program and reaches out to communities throughout the central coast. Cara O’Brien started her career as an interpreter volunteering with Channel Islands National Park and has been an interpreter for California State Parks for 23 years. As an interpretive trainer for CA State Parks she specializes in children's interpretation, communication, Marine Protected Areas, and wildlife disturbance prevention. Cara is the Outreach/Education Coordinator for the Seabird Protection Network Pt. Sur to Pt. Mugu Chapter, a Co-Chair of the San Luis Obispo County Marine Protected Area Collaborative, and the California State Park MPA Outreach Coordinator.